Fat dogs don't become overweight on their own. Since dogs can not prepare their own food, their human guardians are the ones who need to take charge if they're going to lose weight. How much weight does your dog need to lose? How can I make sure that she is getting enough vitamins and nutrients while reducing calories? How do I know if he's overweight at all? The first place to go for advice is your dog's Veterinarian. Or, Ask a Vet Online your questions and get answers quickly. Determining your dogs ideal weight can be a challenge. If your dog is a purebred, there will be a weight range that you can start with to figure out your dogs ideal weight. Your dogs veterinarian should have a weight chart in her office. Another step in the right direction is to learn more about health, training, and overall care of your dog's specific breed, or dog care in general. If you are a dog parent to a mixed breed, then you'll need to do a touch test to determine if you do indeed have a fat dog. Place your thumbs on your dog's spine and spread your fingers across her rib cage. You should be able to discern each rib easily, there should be no more than a thin layer of fat over the ribs. If it feels spongy, if you can't find the ribs, there's a good chance your dog is overweight. Viewed from above, your dog should clearly have shoulders, ribs, waist, and hips. Next, understand that a dog's weight gain is usually gradual, so you may not have even noticed that he's put on extra pounds. Lastly, and this is very encouraging, dog obesity can not only be controlled, but also reversed, and then managed! There are also things you can do yourself. So, we've laid out a few simple ideas to help your overweight dogs. Cut Out Extra Food - Start cutting back with the extra sources of food. 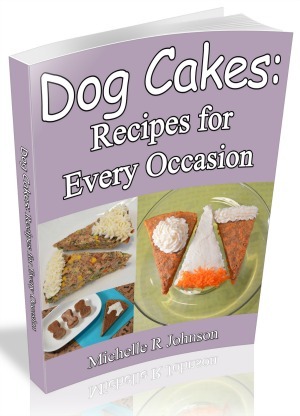 Such as table scraps, another dog's food bowl (or even the cat's food bowl). Make your dog work for his treats, not given them just because. Make your dog do a trick, or learn a new one, to earn that tasty tidbit. Reduce or Change Regular Food - This is where a Veterinarian may be able to help. 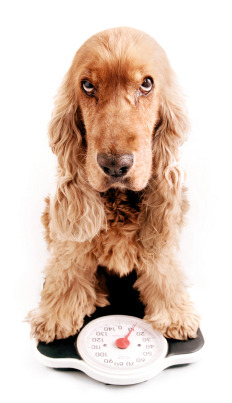 Depending on how much weight your dog needs to loose, you may want to gradually switch to a weight management food. Weigh Regularly - If you have a small dog, you can easily weight him at home. First, weigh yourself, next pick up your dog and weigh again. Subtract the difference between the two and you have your dogs weight. For larger dogs, or for more accurate results you can go to your Vet. Many vet clinics have walk-on scales and wouldn't mind at all if you dropped in to weigh your pet weekly so you can monitor your progress. You may be less inclined to give extra treats if you know you have to go in for a weighing each week. Beyond making changes to food intake, helping your dog get needed exercise is another way of aiding in weight loss. Be sure to slowly introduce new exercises (and consult your Veterinarian or Ask a Vet Online) since your fat dogs joints may be easily harmed by aggressive or excessive exercise. Walks - If you and your dog do not currently go on walks, then you will want to start off slow. Try going for a 5-10 minute walk every other day and gradually build up to longer walks everyday. Play Games - Playing fetch in the back yard is fun way to get exercise. Hide and seek, either with you or favorite toys. Also puzzle toys that hide squeaky toys or very small tidbits of low fat dog treats. Go Hunting - No, not actual hunting. Your dog can go hunting for it's daily food. By dividing his food into several dog treat toys he will have to hunt and work at getting fed. But, before doing this, you need to make sure that your dog understands how the toy works, so he can get the food out of the toy. Advanced Exercise - Once your dog has begun to lose weight, your Vet may approve more vigorous exercise. You can always go for longer walks, but going to a dog park is another fun way to get exercise. You can take an agility class, or work your way up to competing in Fly Ball or Lure Coursing. Having fat dogs is a national trend. It's estimated that nearly half of all dogs (cats, too) are overweight or even obese. But with your Vet's recommendations you can help your overweight dog lose the weight, and gain a healthier lifestyle, vitality, and many more years by your side.